We left Riviere du Loup at noon and headed began our trek to North Sydney. This was an error in judgement on our part. With time not on our side we decided to bypass the Bay of Fundy and opt for a quick stop at Grand Falls. In the queue for the ferry, lucky lane 24. It was suggested by one expat Nova Scotian friends, that we stop at the Irving Big Spot to fill up the vehicle and find healthy snacks for the road. This place was not what I expected. There was fresh fruit, veggies and dip, homemade muffins, whoopie pies and beverages galore. We were back on the road, with drivers rotated, within 20 minutes. We pressed on through the night and arrived in North Sydney at 1:30 am. We didn’t even bring in the luggage, we literally fell into bed and passed out from overexposure to the Trans Canada Highway. We spent the night at the North Star Hotel, located three blocks from the ferry terminal. 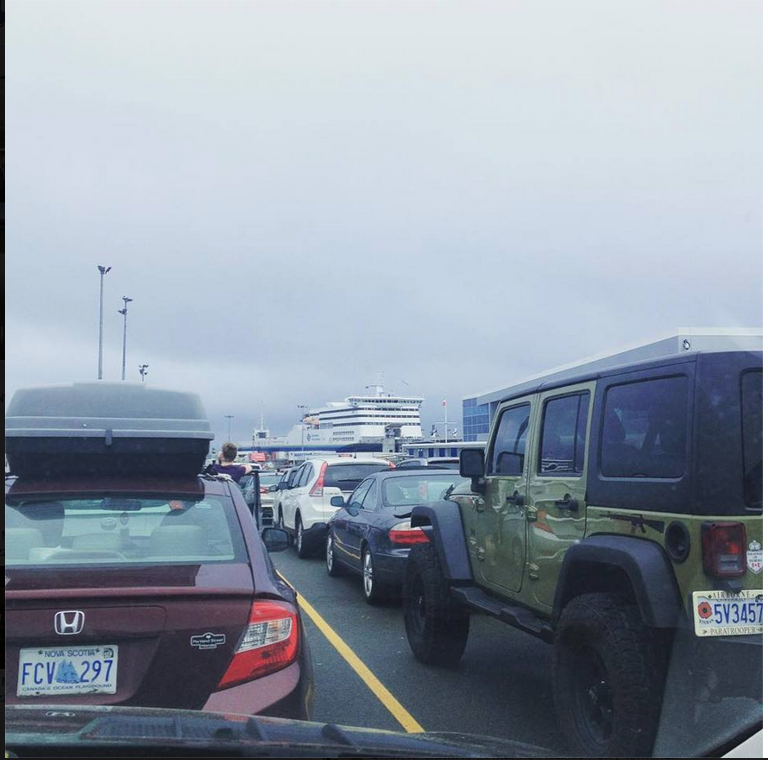 The next morning, we quickly made our way to over to the ferry terminal for 9:30 am, after 2 hours we were finally on the ferry and heading to our four berth cabin. My view from the bottom bunk. A four berth cabin on the Blue Puttees was our home base. Our DD’s enjoyed feeling grown up with their own key to the cabin. We felt very comfortable letting the girls step out on their own while aboard the ferry. According to DD9, she found the best kiosk on the ship. This kiosk severed huge ice cream cones and homemade waffles served with chocolate sauce and whip cream. 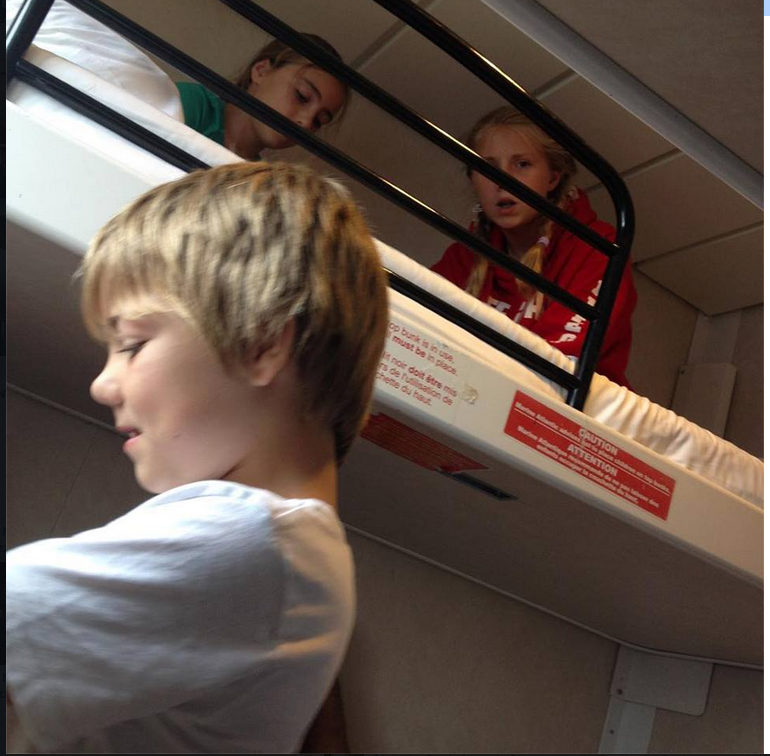 During the 7 hour tour we took advantage of the bunks and napped for various amounts of time. Beckett needed the most sleep and had a three hour nap. The cabin cost approximately $65.00, it was well worth the money for our family’s needs. While the kids slept I took a tour around the Blue Putteer. We arrived in Port aux Basque at 6:15 pm. 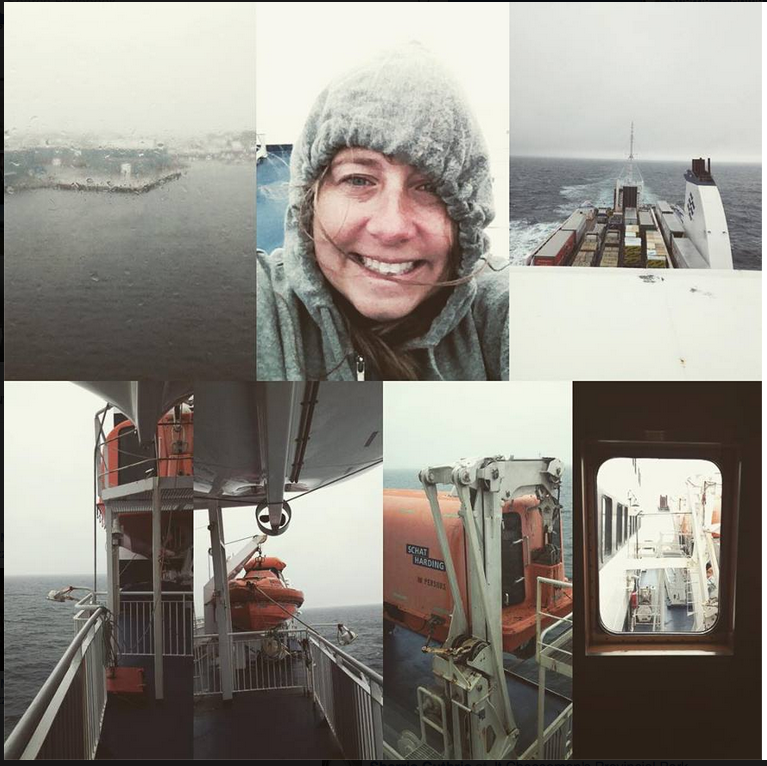 It was raining, wet and I am sure we saw snow when we departed the the boat. We drove around Port aux Basque and listen to DH chat about the places he climbed and explored. When we arrived at Uncle Eric and Aunt Edna’s we were greeted by a huge pot of bubbling moose stew, homemade bread and soda cracker squares. 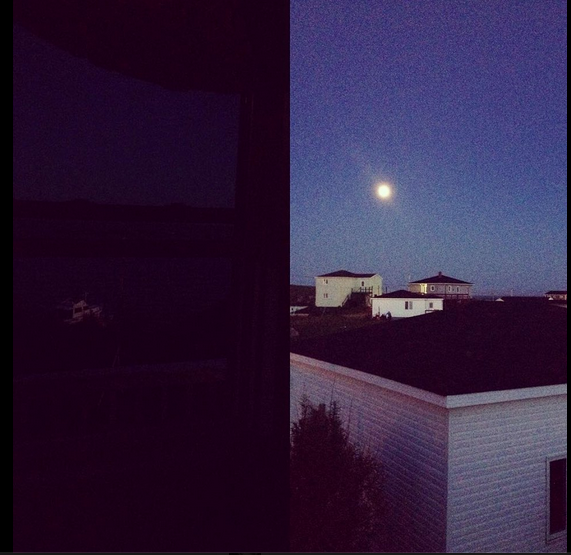 The view from our window and our lonely boat in the moonlight. The kids fell asleep to the sound of the ocean lapping against the rugged rocks in the bay and the fog horn echoing in the distance. I don’t think the kids noticed when we left the room. Our three quickly fell asleep as the adults caught up, laughed and reconnected into the small hours of the night.